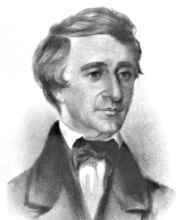 Welcome to Henry David Thoreau online, a website dedicated to one of the most important writers of the nineteenth-century United States and one of the leading personalities in New England Transcendentalism. Henry D. Thoreau is one of America's most important 19th century literary figures. He is famous for the literary excellence of his nature and political writings and best known for his time spent at Walden Pond and the work that came out of that experience - Walden, or, Life in the Woods. Thoreau was a man full of dreams and ideals, writing about nature and philosophy of life. He spoke out on many social issues such as peace, living simply, abolishing slavery, and was a vigorous advocate of civil liberties. He is regarded as one of America's most influential writers.